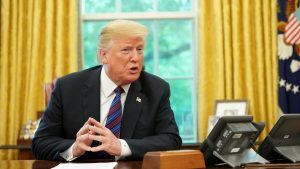 President Trump spoke with the President Enrique Peña Nieto of Mexico by phone this morning, with the media present, to announce a new trade deal. Both men expressed satisfaction with the deal and praised both negotiating teams. Mexico has agreed to purchase more American farm products and ease restrictions on foreign oil companies doing business in Mexico. The most game changing item is an agreement to increase wages to $16/Hr for auto workers in Mexico making car manufacturing more equitable for American and Canadian car manufacturers. Car imports from Mexico will enter the country duty free as long as 85 percent of the parts in the car must be made in North America. Mexico has been importing parts made cheaply in Europe and Asia (mostly China). The US will impose a 2.5 percent tariff on cars that don’t meet the agreement’s terms. The current low wages for Mexican auto workers, about $6/Hr, has been a major concern in America and Canada. The new agreement will likely move trade talks with Canada forward. The Canadian foreign minister, Chrystia Freeland, indicated she had been in touch with the negotiators and added: “We will only sign a new NAFTA that is good for Canada and good for the middle class.” She will come to Washington on Tuesday for further talks. Trump also announced that the deal was negotiated with both the current president and the future president, Andrés Manuel López Obrador, ensuring a smooth trade transition as Mexico’s new leader takes office. The stock market and businesses love certainty. Today’s positive news saw the DOW crossing the 26,000 mark again. The Nasdaq climbed to an all-time high, breaking 8,000 for the first time and the S&P also hit a record high. In 2017 Mexico’s trade surplus with the United States was $63. to $71 billion. The “United States Mexico Trade Agreement” should reduce that surplus considerably creating positive outcomes for the people of both countries. The new deal will be presented to Congress later this week. I expect rabid criticism from the usual suspects. The question should be whether this deal is better for America and the people. Party politics usually color issues just prior to elections. Will our representatives in Congress (18% approval) put America first or will they continue to play partisan political games? This entry was posted in Business and Industry, Foreign policy and affairs. Bookmark the permalink. Yep. If only Chris were here to call Trump’s trade deal xenophobic, racist and something no “True Scotsman” would do. Kushner is also a key player in the ME. Saudi Arabia acknowledged Israel’s right to exist and live in peace. The progress that’s been made has received very little media attention but a shift has definitely taken place. It derives from the context Trump created in his Speech to the Arab Islamic American Summit. The negotiated from Canada cut her visit to the UK short yesterday on the news and headed for Washington. I expect a Canadian deal will soon be announced. One of Canada’s issues was the low wages by car manufacturers in Mexico. Now that issue has been addressed. Winning is wonderful. Life works when everyone wins. Simple concept, too bad people are often too pig headed and fearful to arrange their lives thus.